Accidents are commonplace and can burn a hole in your pocket. While there isn't a way to safeguard yourself or your dependent family members from mishaps or bad luck, there definitely is a way to cover your expenses in case you meet with such unwanted luck.! While many of us are aware of life insurance, motor insurance and health insurance, very few know about accident policies, also known as Personal Accident Insurance policy. Go through these seven frequently asked questions to know more about this policy and who all should opt for it. Personal Accident Insurance protects your finances by providing a lump sum compensation in the unfortunate event of a fatal accident or one that disables you permanently. The compensation shields you and your loved ones from a financial crunch. This insurance also covers accidental hospitalization cost. Note: The amount of compensation depends upon the sum insured. 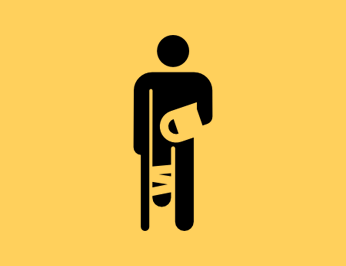 What qualifies as Permanent Total Disability? I am a homemaker who spends majority time at home. Do I also need a Personal Accident Insurance? Accidents can happen to anyone. Motor accidents, rail accidents, natural calamities, the list is endless. These can sound scary. But, getting intimidated is not the solution, being financially prepared is. Opting for a Personal Accident Insurance helps you to meet expenses in case a crisis arises. I travel to different countries often for business and at times for leisure. What if I meet with an accident outside India? You can be rest assured, accident policies offer worldwide coverage. Your claim will be paid even if you meet with an accident overseas. I already have a health and life insurance cover. Why should I buy Personal Accident Insurance? Life insurance offers a death benefit to your nominee in case you pass away. Health insurance provides a compensation and/or reimbursement of hospitalization and other medical expenses. A Personal Accident Insurance policy, on the other hand, insures against the financial risk that could arise due to accidental permanent total disability or accidental death of an earning family member. In short, the policy is essential as it strengthens your financial portfolio securing the future of dependent family members against unforeseen events. What happens if I am hospitalized after an accident takes place? Would it cover hospitalization expenses? Yes. You can avail optional covers by paying an additional premium. An Accidental Hospitalization Cover provides reimbursement for medical expenses related to hospitalization and a Daily Cash Cover provides you with a cash allowance for each day of hospitalization. Would I need to pay a high premium for availing Personal Accident Cover? No. For example, the premium for a basic policy of Rs. 5 lakh (duration 1 year) is approximately Rs. 610. It is but a small price for ensuring your family's financial security.! I have a family to support. Does Personal Accident Insurance cover death? Yes. All you need to do is mention the name of your nominee in the policy document. The sum insured will be paid to your nominee by the insurance company.